Pachysandra terminalis 'Variegata', is a hardy and easy to grow evergreen groundcover. 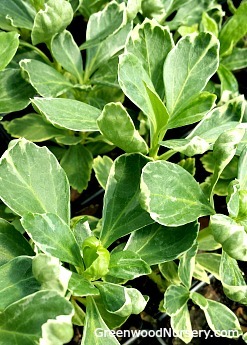 This variegated cultivar is quickly becoming one of the most popular ground covers. As a maintenance free ground cover, Pachysandra Variegated thrives even in the dense shade of evergreens! Plant this shade loving plant under lower growing trees and shrubs. This particular Pachysandra is low and compact, retaining its dense beauty with white tinged leaves, even in adverse conditions. It forms a solid mat of glossy foliage 6 to 8 inches high. Plant 12 inches apart in deeply prepared soil enriched with compost. Close planting protects the roots. Keep watered until established. Planting Zones 4 - 8. Plant spacing: Plant 12 inches apart, 100 plants cover a 100 square foot area. Pachysandra Variegated ships as bare root plants - 1 order contains 25 plants.